When your home or business is damaged by fire, burglary or weather related issues, it is important to board up any exposed areas as quickly as possible to keep the elements out and discourage trespassing and looting. Roth Construction is the greater Columbus Local Service Provider for 1-800-BOARDUP, a national emergency response company. 1-800-BOARDUP facilitates around-the-clock emergency board up services for all the windows, doors, roof and any other areas of the structure that have been damage by fire or weather related damage. Our skilled and trained local professionals are experienced in all facets of securing a location that has been damaged by fire, weather, vandalism or any other form of damage to your home or business structures. 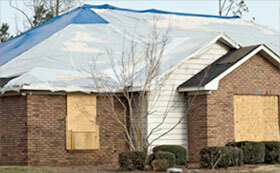 1-800-BOARDUP has operators on call 24/7 and will be on scene in 1-Hour. We will bill your insurance company directly and in most cases, there is no charge to the insured victim. If you are in need of prompt assistance after a fire, storm or other disastrous event, call the professionals at 1-800-BOARDUP – America’s best emergency responders!